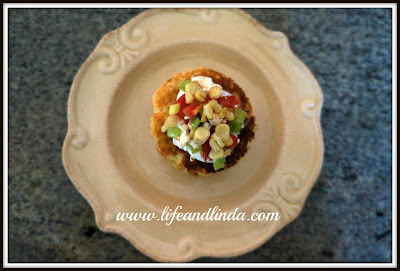 Here's another great appetizer that is different. There's nothing like fresh corn.....I cut the corn off the cob. In a 12 inch nonstick skillet, heat 1 tablespoon vegetable oil over medium heat. Add the corn kernals in an even layer; sprinkle generously with salt. Cook, without stirring, for about 3-4 minutes until the corn kernals are sizzling. Give the pan a shake and continue cooking about 15 minutes, or until kernals are slighty brown. Reserve 2 tablespoons of corn kernals. Meanwhile in a bowl, whisk together flour, cornmeal, 1/4 tsp. salt, and baking powder. Whisk in milk, egg, and the 1 tablespoon vegetable oil, mixing just until batter is smooth. Stir in the chopped onion and browned corn. Wipe skillet out lightly with oil paper towel. Heat over medium heat. Drop batter by 1 or 2 tablespoons. cook about 1 minute per side and turn. Repeat with remaining batter. 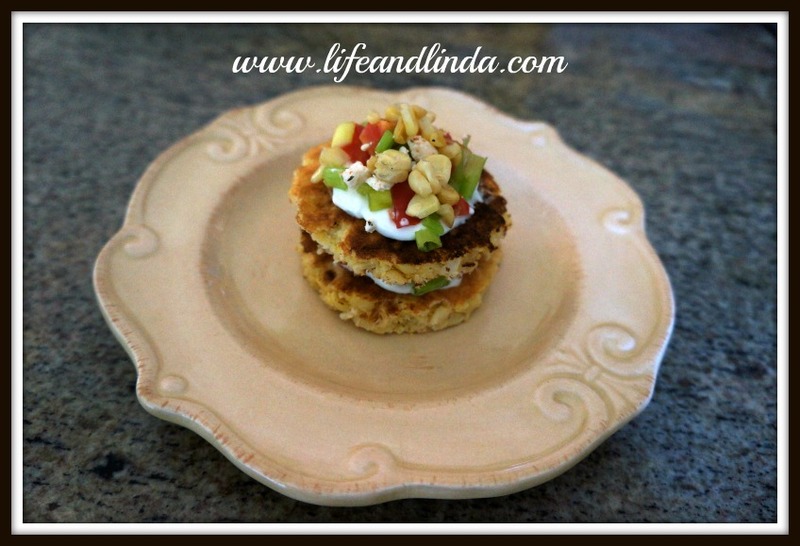 Top each griddle cake with sour cream, if desired, tomato, green onion, feta cheese and reserved corn kernals. I stacked mine for a great look! I also used a biscuit cutter to make mine more precise. Enjoy! This looks delicious!! Sounds like something my daughter, Amber, would love!! We will be going down there next week and I am going to try this. You and she seem to cook along the same lines. dang, that's sound awesome. May have to try it! beautiful dish and of great effect. I love fresh corn too. The best time to harvest it is now in Italy. So tender and full of taste! Yum..that looks so good, I could make a meal out of those. I like the way you cut and stacked the griddle cakes...a really pretty presentation. Oh YUM! This sounds fabulous Linda. Oh that sounds so good! And looks delicious! This looks delicious! I do have a bag of cornmeal sitting around (left over from previous bakes) and this looks like a great recipe for me to use that. Oh boy this looks like you would have a hard time not filling up on them! P.S. Your layout is too cute! Thanks for sharing at Mealtime Monday! I can't wait to see what you link up next week! I can just taste all the flavors of this super seasonal dish. I would love if you would share it on foodie friday today. I just found your blog from Flour me with love.. looks terrific my sister's name is Linda and she is a dancer too. 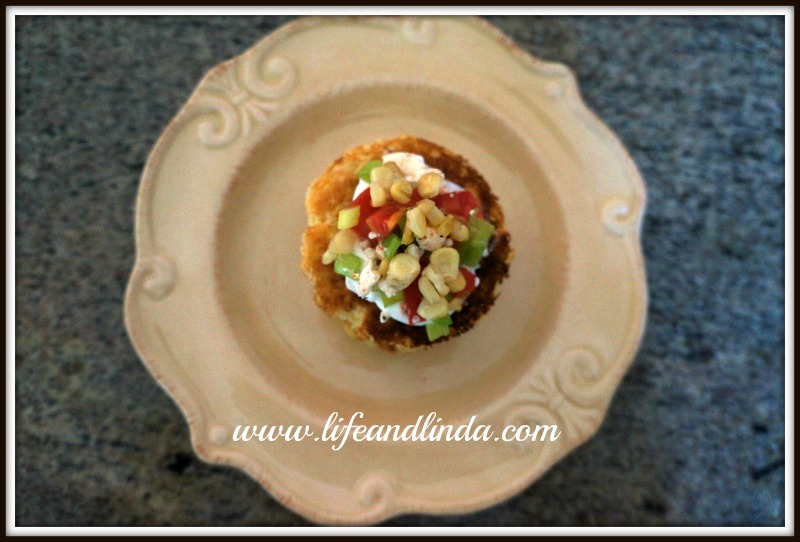 Hi Linda: Thank you for sharing this recipe--it looks wonderful!